Most breakfasts only get better with a great bagel. Finding the best spot in town for getting them fresh can make all the difference. Whether you like it toasted or cold, with cream cheese or jam, Nevada has a bagel shop where you’ll find your favorites. Here are the eight best bagel shops in Nevada seving up freshly-made delights to get your morning going. This small, authentic New York-style deli offers some of the freshest bagels you will find anywhere. Their menu has both the standards and some not-so-standard choices. Bagels are made on-site so you can't get much closer to the source than that. They also make a variety of other bread items as well. A combination of a bagel factory and a quaint little cafe make this an interesting spot to spend the morning. Enjoy bagels fresh daily and take some home for the rest of the week. Their expanded menu makes dining on-site a great choice. Using the best ingredients is what sets these bagels and donuts apart. Everything is made on-site and there are well known for both bagels and their unique spin on the donut. Baked goods are king in this little shop. This is a well-guarded secret for locals. This small, local source for bagels is also a well-guarded secret for their loyal customers. Word of mouth keeps the customers coming in, and their fresh, rotating stock makes a fan out of each new customer. Made fresh on-site, these bagels are best served warm. The smell is welcoming but the taste is something you won't soon forget. It isn't unusual for locals to spend a long morning their visiting and enjoying a few bagels before replenishing their home supply. This is classic counter diner with fresh basics. A throw back to the old neighborhood diner, this may just become your go to breakfast spot. 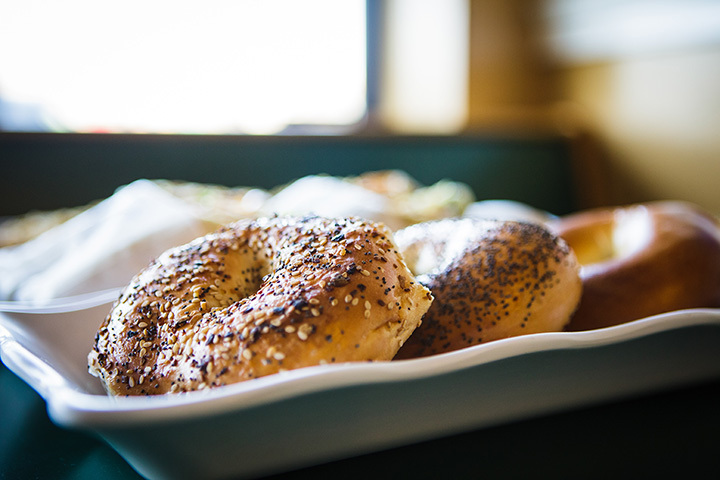 The bagels are fresh and the food is served exactly how you would expect. The no frills approach to breakfast lets this small cafe focus on delivering the freshest bagels possible. They center their whole menu around the one thing they do best, which is the New York-style bagel. A favorite for locals and a busy weekend spot. In true New York deli fashion, this small local favorite serves the best of comfort food. The bagels are fresh and the sandwiches are hearty. They also serve a full range of bagels to go and other pastries.